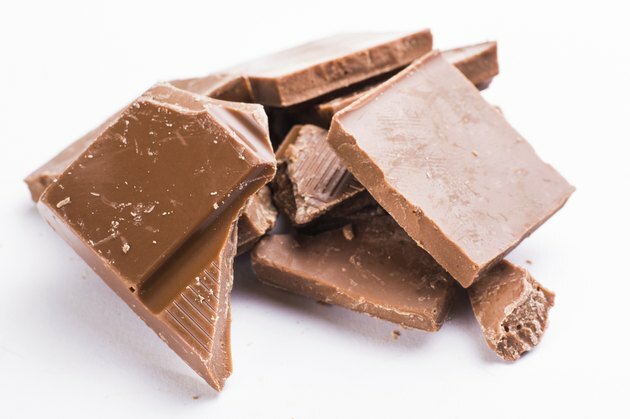 If the thought of giving up chocolate during your first trimester, and beyond, makes you break out in a cold sweat, rest assured that chocolate is safe to eat while you're expecting. That doesn't mean, however, that you can pop as much chocolate in your mouth as you want. While certain types of chocolate do supply nutrients your growing baby needs, chocolate is also high in saturated fat and sugar and also contains small amounts of caffeine. The drawbacks to eating a lot of chocolate, though it's completely safe, is that the treat contains large amounts of calories, fat and sugar, and too much of any of these can increase your risk of weight gain, which is a concern for many women during pregnancy. A 1.55-ounce milk chocolate bar, for example, contains 235 calories, 13 grams of fat and 22.7 grams of sugar. The same amount of white chocolate has 229 calories, 13.6 grams of fat and about 25 grams of sugar, which is more than 6 teaspoons. A similar serving size of dark chocolate has 246 calories, about 15 grams of fat and 15 grams of sugar. Another potential drawback to eating chocolate during your first trimester is that it contains caffeine. According to the BabyCenter website, moderate amounts of caffeine are considered safe during pregnancy. Eating a small amount of chocolate isn't too worrisome because the sweet treat is far lower in caffeine than coffee or tea, but if you eat a lot of chocolate, it can add up. An ounce of chocolate has about 26 milligrams of caffeine, according to the American Pregnancy Association. Limit yourself to 200 milligrams of caffeine or less per day during your first trimester, as well as your entire pregnancy, the March of Dimes cautions. When you do have a serving of chocolate during your first trimester, you'll take in certain nutrients that your unborn baby needs to grow properly. A 1.55-ounce serving of milk chocolate supplies 1.03 milligrams of iron toward your daily goal of 27 milligrams. Adequate amounts of iron increase the chances that you will deliver a full-term infant and that your baby will be a normal birth weight. White chocolate doesn't contain any iron, but dark chocolate contains even more than milk chocolate. Milk and dark chocolate also supply zinc and vitamin K, but white chocolate contains far less of these nutrients. A 2008 article published in "Epidemiology" reports that chocolate might reduce the risk of pre-eclampsia, which is high blood pressure during pregnancy. If you have gestational diabetes, it's probably best to skip the chocolate, but, of course, talk to your doctor about what your diet should look like if you have been diagnosed with this condition. When you do eat chocolate, eat it in moderation, and opt for dark chocolate, which contains less sugar than milk or white chocolate. Eat an ounce or so as a tasty dessert or grate the chocolate over plain Greek yogurt for a treat that's also rich in calcium and protein. BabyCenter: Is It Safe to Eat a Lot of Chocolate During Pregnancy?